Malaysia's Tee Jing Yi earned herself a shot in the second round in the women's singles in the Rio Olympics with a 22-20, 21-15 win over Czech Republic's Kristina Gavnholt in a Group K match. However, with only the group champion advancing to the second round, Jing Yi will have top beat Japan's 10th seed Akane Yamaguchi in her second group match on Sunday. But what Jing Yi displayed at the Riocentro Pavilion 4 on Saturday was a spirited performance from the world 29th ranked player. Known for her fighting display each time she takes the court the Malaysian badminton team can possibly count on the player from Penang. Akane is ranked a high 12 in the world but she was taken the full distance by Kristina in her matchon Friday. The Japanese won 20-22, 21-12, 21-15. The Japanese leads Jing Yi 2-0 in her head to head count but that will not count for anything when you are playing in the Olympics. Akane defeated the Malaysian in the 2014 Asian Games and also in last year's German Open. It was mixed fortunes for Malaysia in the doubles events in their final group matches - to decide the group champions for the quarter-final draw. There was plenty to cheer in the Malaysian camp when top doubles pair Goh V Shem-Tan Wee Kiong pulled off a stunning three-set win over China's world No 4 Fu Haifeng-Zhang Nan to top Group B. In the women's doubles Vivian Hoo-Woon Khe Wei put a tremendous performance against third seeds Nitya Krishinda Maheswari-Greysia Polii before losing 19-21, 21-19. "We simply lacked that extra to win against the Indonesiasn. Still we are happy with our overall performance and ready to face anyone in the quarter-finals," said Vivian Hoo on the sidelines after the match. 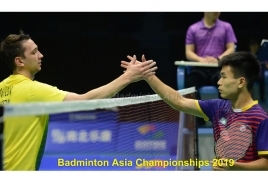 In the mixed doubles Chan Peng Soon-Goh Liu Ying were also on the losing end - going down 15-21, 11-21 to Indonesia's Tontowi Ahmad-Liliyana Natsir in their final Group C match.